Norbert “Cimbi” Kovács started dancing at age 9 with an amateur ensemble in Ajka near his hometown of Devecser in western Hungary, and by his early twenties was artistic director of the group. 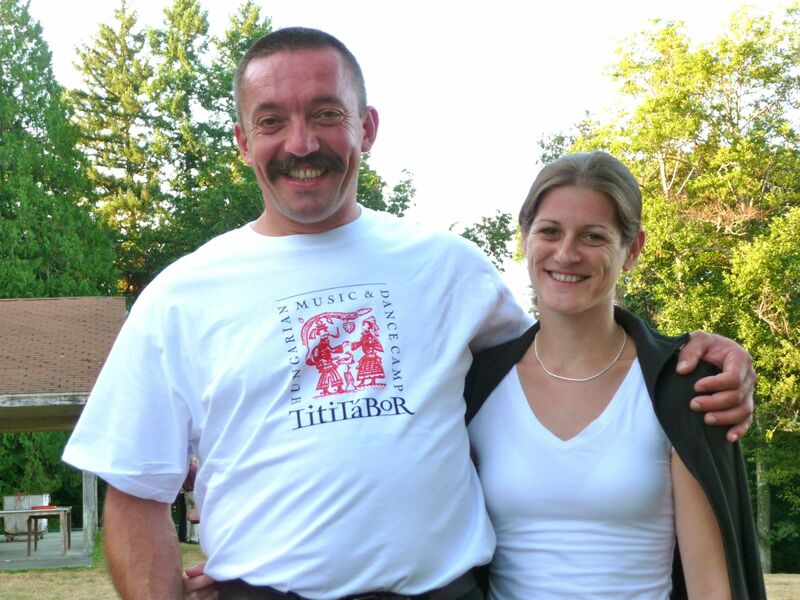 He has worked with many performing groups and has taught widely throughout Hungary. He is a 1997 recipient of the “Young Master of Folk Art” and has received the highest solo dance honor of three “Golden Spur” awards (in 1997, 1999, and 2001), which makes him a “Perpetual Golden Spur” winner. Beáta Gaschler danced and studied with various dance groups in Ajka in western Hungary, was the women’s leader in the Apte Dance Ensemble, and is the recipient of the Sirítő award for solo dancing. She is currently an active dancer and student in the folkdance instructor program at the Hungarian Dance Academy. She is a resident of Kiscsősz and teaches several children’s groups there, and travels the world teaching with her husband, Cimbi.